For this week of TWD Leslie of Lethally Delicious decided on Tarte Fine - go to her page to find the recipe, or flip through Dorie's book to page 315. 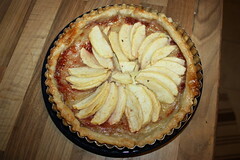 Tarte Fine is a french classic - the recipe says. When I read the ingredients and this introduction, I had a certain picture in mind. 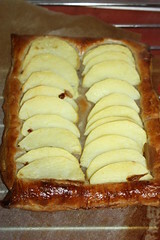 A picture of a very thin tarte crust (the "fine" part in the Tarte Fine, I thought), layered with apples. Well, the second part of my guess was right, but the "crust" should be puff pastry. Unfortunately, I am not a big fan of puff pastry. It has a lot of fat and calories for not so enormously much taste. In this respect it reminds me very much on a croissant. When I see a croissant I always ask myself why I should eat something as fat and full of calories as a muffin, but without any taste of itself (despite, maybe, the taste of butter). The second point why I am not a huge fan of puff pastry is that it's not a good keeper. I always bake on Sunday and bring the treats to work the next day, so anything puff pastry is always difficult and never a big success. So. Let's just not speak too much about this tarte and start thinkig about the next apple recipe, which is just one week ahead with the Double Apple Bundt Cake to come! PS: Don't forget to visit Leslie's page anyways! She is one of the nicest, most helpful and most awesome bakers of all these awesome TWD-ers! You are so sweet! Thanks so much for your kind thoughts. I'm definitely more of a puff pastry fan than you, so BOTH of your versions look great! 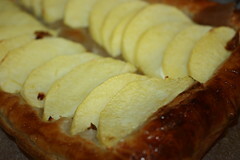 And can I tell you how impressed I am that you made this a second time in spite of not being a puff pastry fan?! Your coworkers certainly love you for all of your spoiling of them. Thanks for baking with me-twice!-this week! ciao ! I made it round but liked it luckily !! I'm sure your colleaugues will love the second tarte !